Download this white paper to learn how to engage with customers, wherever they are. As the world becomes more and more digital, it’s vital for all businesses (from the tiny mom- and-pop shop to the massive corporation) to be able to communicate with customers whenever and wherever the customer wants. Whether through phone call, SMS text, online chat, social media or whatever the next big “thing” is – your customers are waiting for you to connect. 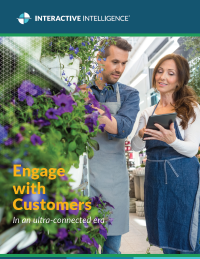 Download this white paper to learn how to engage with customers, wherever they are.